Arista Comes up with 400Gb Switch in the market on 23rd Oct, 2018. It was proposed by Arista that the new 400G fixed systems bring the performance that hyper scale cloud networks and datacenters need for the development of applications such as AI (artificial intelligence), machine learning, and server less compute. The New Arista 400 Gb Switching platforms which are based on the Broadcom 12.8 Tbps Tomahawk 3 silicon, support 32 400G ports in a dense 1U chassis. In addition, each 400G port can be fragmented into four 100G ports, which supports a total of 128 100G ports in a 1U chassis. Arista comes up with 7060X4 models which support 400 Gb support. The Arista Switch 7060X4 Series is accessible in two configurations supporting with both OSFP and QSFP-DD 400G optics modules. The Arista’s 7060PX4-32 model upkeeps 32 ports of OSFP. The Arista 7060DX4-32 has 32 ports of QSFP-DD, with the consistent 7060X Series architecture. 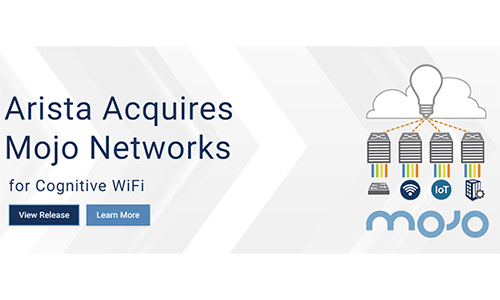 Arista Networks acquired Mojo Networks and Arista Networks announced their entry into campus networking under the solution “Cognitive Cloud Campus”. Mojo networks is named under the visionary in Gartner quadrant n wired and wireless networking and hence with this move Arista Networks comes into the campus wired and wireless networking. Arista Networks founded software-driven, intellectual cloud networking for large-scale datacenter and campus atmospheres. Arista's award-winning platforms redefine and bring availability, agility, automation, analytics and security. Arista has transported more than 15 million cloud networking ports worldwide with Cloud Vision and EOS, an innovative network operating system. Dedicated to open standards across private, public and hybrid cloud solutions, Arista products are supported worldwide directly and through partners. “Mojo’s Wi-Fi is disrupting the old-fashioned closed wireless controller model, to bring radical improvements in scale and economics,” said John McCool, Chief Platform Officer and Senior Vice President of Engineering and Operations for Arista Networks. Analysts from Morningstar investments report that Arista’s expansion into campus networking was at the request of existing customers who are currently using Data Center networking within their campus environments. Arista in close partnership with VMware will expand opportunities from Data Center into campus, branch, IOT and edge, Arista’s main attack on traditional 3-tier campus networks not only attacks Cisco, but also their access networking partner HPE Aruba. This strategy hinges on intent-based networking enhancements to their CloudVision SDN controller highlighting the value proposition of unified management for Data Center, Campus, and Branch. This declaration allows Arista to enter for campus openings where it may already have a Data Center impression or through partner pull-through. But this tactic being prejudiced on fragmented partnerships and meeting competing products also puts them at jeopardy of not being able to execute on what customers actually require. Let’s see how the Arista will act on their customers with the new portfolio of the wired and Wireless domain. Enhanced Interior Gateway Routing Protocol (EIGRP) is an advanced distance-vector routing protocol that is used on a computer network to help automate routing decisions and configuration. The protocol was designed by Cisco Systems as a proprietary protocol, available only on Cisco routers, but Cisco converted it to an open standard in 2013.
" So now EIGRP is a Open Standard Routing Protocol, It means EIGRP can be used in other vendors as well"
Now question arises, Why EIGRP replaced IGRP Protocol ? One of the major reasons for this was because the design of the Internet Protocol had been changed to support classless IPv4 addresses, which IGRP could not support.
" EIGRP Replaces IGRP protocol because IGRP doesn't support Classless inter domain routing"
Routing table, Neighbor Table and Topology Table, Lets Start discussing about all these tables. Routing Table:-That contains rules by which traffic is forwarded in a network. If the router does not contain a valid path to the destination, the traffic is discarded and the path is not there in the routing table. Neighbor Table: The neighbor table keeps a record of the IP addresses of routers that have a direct physical connection with this router. Routers that are connected to this router indirectly, through another router are not recorded in this table as they are not considered neighbors. Support for Classless Inter-Domain Routing (CIDR) and variable length subnet masking. Routes are not summarized at the classful network boundary unless auto summary is enabled. Support for load balancing on parallel links between sites. The ability to use different authentication passwords at different times. MD5 authentication between two routers. Sends topology changes, rather than sending the entire routing table when a route is changed. Periodically checks if a route is available and propagates routing changes to neighboring routers if any changes have occurred. Runs separate routing processes for Internet Protocol (IP), IPv6, IPX and AppleTalk through the use of protocol-dependent modules (PDMs).
" So EIGRP protocol with so many features is better to use rather than any RIP, IGRP protocols"
EIGRP routing information exchanged to a router from another router within the same autonomous system has a default with AD 90. EIGRP Summary routes has a default AD of 5. EIGRP does not operate using the Transmission Control Protocol (TCP) or the User Datagram Protocol (UDP). This means that EIGRP does not use a port number to identify traffic. Since EIGRP does not use TCP for communication, it implements Cisco's Reliable Transport Protocol (RTP) to ensure that EIGRP router updates are delivered to all neighbors completely. 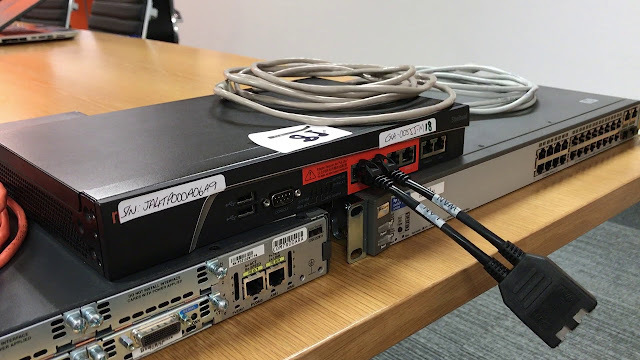 EIGRP uses port no 88 on RTC to identify traffic. The reliable transport protocol also contains other mechanisms to maximize efficiency and support Multicasting.
" 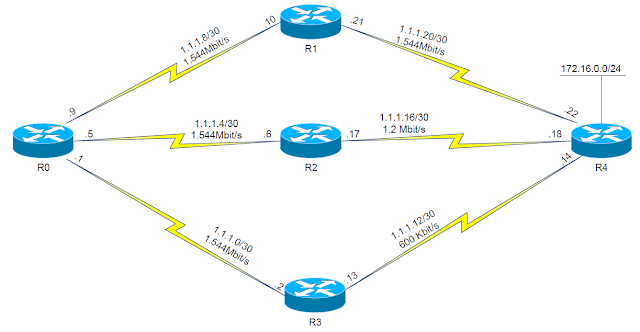 So EIGRP protocol having AD 90 for internal, AD 170 for external and AD 5 for summary routes"
" EIGRP is not Application layer protocol, as it doesn't using TCP or UDP for identify Traffic, while it uses RTC with port no 88 to identify traffic and RTC is the part of EIGRP"
Bandwidth: Minimum Bandwidth (in kilobits per second) along the path from router to destination network. MTU: Minimum path Maximum Transmission Unit (MTU). where the various constants ( through ) can be set by the user to produce varying behaviours. An important and unintuitive fact is that if is set to zero, the term is not used (i.e. taken as 1). The default is for and to be set to 1, and the rest to zero, effectively reducing the above formula to . 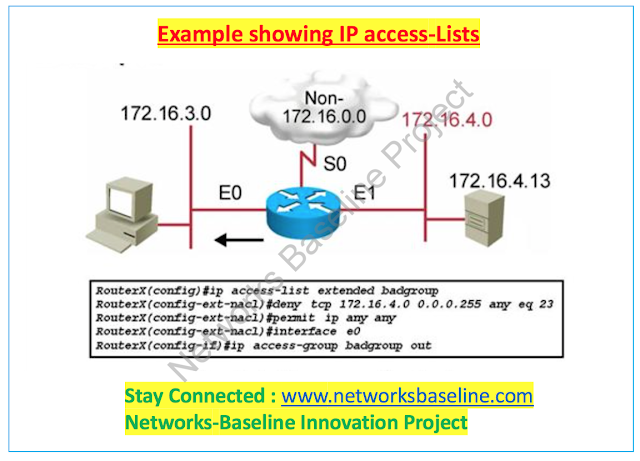 This is all about the basics of Part-1 in EIGRP, we will discuss in Part-2 about the IOS configurations, Feasible Successor, Active and passive state, Feasibility condition and a running example with Scenario. Riverbed metallic Head EX combines pleasant-in-class optimization with virtualization and storage consolidation to your branch places of work and all their applications walking at height overall performance throughout hybrid networks. With the help of steel Head EX allows you to consolidate previously orphaned offerings onto the first converged infrastructure answer purpose-built for the department. Consolidating and virtualizing with steel head EX streamlines operations, decreases costs, simplifies control and allows more responsive carrier delivery. With growing strain to do more with fewer resources in branch places of work, it's far an increasing number of centralizing and virtualizing branch office servers to reduce costs and streamline control. The Riverbed Steel Head EX series is a specialized product line focused on the needs of active branch offices. The Riverbed Steel Head EX series combines WAN optimization and virtualization to enable organizations to meet the needs of the active branch office with an enterprise-class branch office box. Built on VMware, the Steel Head EX series offers the performance of the award winning RiOS and flexibility of the Riverbed Virtual Services Platform (VSP) for greater consolidation than ever before. The Steel Head EX series offers a new approach to consolidating branch office infrastructure, enabling the fluid enterprise by simplifying branch management, reducing costs, and increasing operational agility. Services such as DNS, DHCP, and print services continue to remain in the branch on dedicated, remote servers. This limitation increases management complexity, as well as the operational and capital costs of running a branch office. 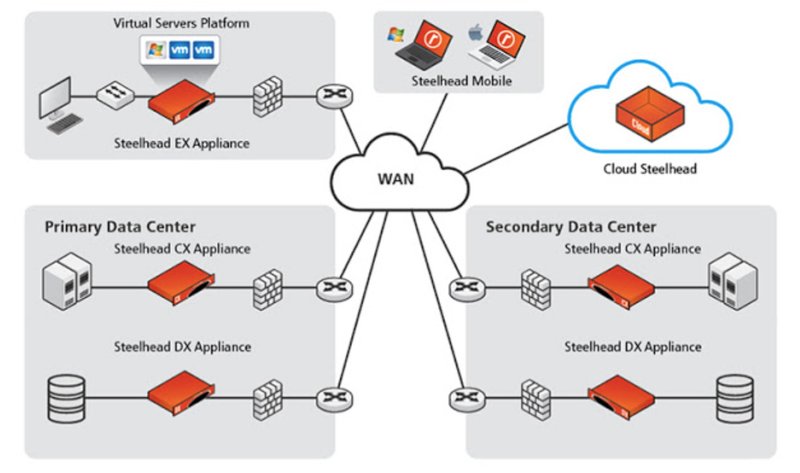 With Steel Head EX, you can virtually run network and application services in any branch office. Every Steel Head EX solution features the Riverbed Virtual Services Platform (VSP), a dedicated platform with VMware v Sphere virtualization services that can be run virtually in any branch office to enable consolidation. Deploying Steel Head EX, you can run edge services virtually in all of your branch offices — without having to deploy and manage standalone servers. Steel Head DX is purpose-built for the optimization of records middle-to-statistics middle workloads, turning in up to 60x enhancements in throughput across hybrid networks with high latency and/or packet loss and lowering bandwidth requirements by up to 99%. Metal Head DX can optimize, transfer and replicate information with more visibility and manage, all with much less fee and hazard. This ensures you could obtain carrier degree agreements, make certain fast statistics recuperation instances and enhance enterprise continuity Steel Head DX equipment gives the excellent charge/performance price for optimizing statistics center to records center replication workloads, handing over improved optimized WAN potential at decrease fee. The Riverbed Optimization machine (RiOS) is more desirable and tailored for steel Head DX to offer elevated records streamlining and delivery streamlining performance for excessive velocity statistics switch and replication workloads and with assist for a pick out set of software streamlining optimizations for common DR applications. Steel Head DX can provide superior performance, visibility, and control of commonplace catastrophe healing (DR) packages, including NetApp Snap mirror and EMC Symmetrix faraway statistics Facility (SRDF)/A. RiOS volume-granular network QoS ensures that the maximum important records replication strategies entire on time every time. best-grain visibility and manage of individual garage replication workloads ends in stepped forward performance, predictability, and enterprise making plans. Purpose built for data center-to-data center deployments: Best price/performance value for optimizing data center-to-data center replication workloads, delivering increased optimized WAN capacity at lower cost. New Turbo Data Streamlining option designed for higher data replication performance between data centers. Available only for the DX appliance. Select set of application streamlining capabilities included for common DR applications, such as NetApp Snap Mirror and EMC SRDF/A. As Cisco acquires Duo Security in $2.35 Billion, a privately-held, unified access security and multi-factor authentication company headquartered in Ann Arbor, MI. Together, Cisco and Duo fortify our leadership in technologies that control user access to networks and applications. Duo was founded in 2009 by Dug Song and Jon Oberheide, in Ann Arbor, Michigan. Companies that have deployed Duo's two-factor authentication systems include Facebook, Etsy, Yelp, Panasonic and Toyota. Duo’s 100% cloud-based offering will provide Cisco a strength with a unique opportunity to insert a low friction, highly relevant security offering into customers environments. Duo's technology is a highly calculated addition to Cisco's portfolio and will help hasten its intent-based networking strategy by spreading intent-based networking into multi cloud environments and streamlining the policy for cloud security and expanding endpoint visibility coverage. Duo is the prominent provider of unified access security and multi-factor authentication delivered across the cloud. Duo's resolution verifies the identity of users and the health of their devices before permitting them access to applications and helping to prevent cybersecurity breaches. Incorporation of Cisco's network, device and cloud security platforms with Duo's zero trust authentication and access products will help enable Cisco customers to easily and securely connect users to any application on any networked device. With this acquisition, Cisco is leading now in the cloud based effective zero-trust security posture in less time. With the help of Duo portfolio, Cisco agains the access to the Unify application access security on the network and in the cloud using simple SaaS products. The main focus of Duo was on the ensuring compliance by verifying user and device trust in an ever-evolving regulatory landscape.